I just love to make bags, purses and totes. In my library of patterns/instructions I came across the 'Hexagon Bag'. Gosh I wrote this in 2008 after seeing something similar on the internet. Honestly there are lots of designs out there, but finding one perfect for myself to follow was another matter. So I took pen to paper and came up with this pattern and instructions. I have made three of these. The one in the picture was my first, and I always gets comments on it when in use. It is a comfortable size for me. So, if you would like a free pattern click on the link and I will email a copy. You can make it larger by adding more hexagons to the pattern or by making them larger in size. Good for using up scraps of material if you want a 'jewel' to it. 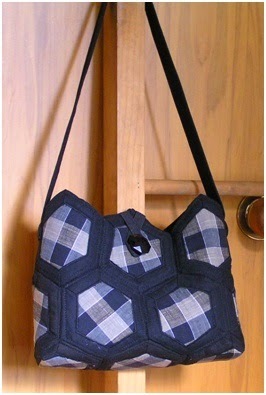 For this bag I cut up an old blouse for the hexagons and backed it with black cotton. I joined them up by hand, but to be honest it would have been quicker by machine; and what an array of different stitches you could use. Let your imagination run wild!